Police are investigating a potential wildlife poisoning in Londonderry. Carcasses of game birds were pegged up in a woodland in the Victoria Road area "in order to poison wildlife", said the Police Service of Northern Ireland (PSNI). "We will be having these examined to find out what surprises have been left on the carcasses and other raw meat," it said. Wildlife expert Mick Conway described the incident as "disgraceful". "Poison can be used to kill a lot of animals but I really think foxes could be the target here," Mr Conway told BBC News NI. "Foxes and badgers are targeted a lot, more than people might realise. 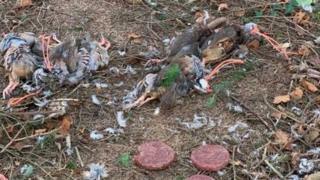 "The pine marten will also eat meat so it's worrying to see raw meat being left too. "There are pine martens in that area so it would be upsetting if they were being targeted. "Indiscriminate poisoning is a real problem, though, and the red squirrels are very busy in the Prehen area too." A PSNI spokesperson said: "The current popular poisons used for wildlife crime are toxic to humans and potentially fatal to children. "It beggars belief that these have been left in a public place where kids could pick them up. An investigation has commenced."